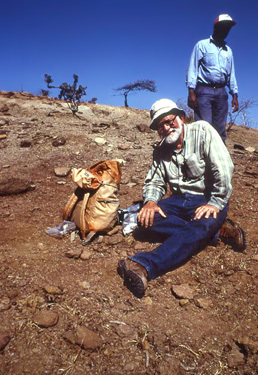 Bill Clemens at work in the Upper Jurassic Mugher Mudstone Formation, Ethiopia. Photo by Mark Goodwin. JANUARY 2015 UPDATE: Our oral history funding goal has been met, however, UCMP welcomes donations in other areas. UCMP is embarking on a mission to fund a professional oral history by Berkeley's Oral History Center (formerly ROHO, Regional Oral History Office) of Dr. William "Bill" Clemens, one of UCMP's legacy paleontologists. Ah, the tales Bill could tell; and that's just what we would like him to do! Bill possesses an extremely valuable trove of paleontological lore and we must get those tales recorded, especially as they pertain to our exceptional collections. Since its inception in 1954, ROHO has completed more than 4,000 interviews with persons in all fields who have made significant contributions to the history of the University of California, the nation, and the interconnected global arena. After significant background research and preparation, a trained historian/interviewer will conduct the interview with Bill (~20 hours). For a richer and more complete story, there will also be interviews (~10 hours) with some of Bill's former students. All interviews will be recorded and transcribed, and ultimately be accessible on the UCMP website. Bound copies will be deposited at The Bancroft Library and UCMP. Short video excerpts from the interviews will also be prepared. UCMP is pleased to contribute $5,000 towards the $25,000 needed to fully fund this worthy project. To date, the Clemens Oral History Project fund has raised $11,550. Please consider making a contribution that will result in the documentation of Bill's life, his deep and profound influence on the field of vertebrate paleontology, the UCMP, our students, and decades of research, teaching, and service. Join us today and the many others who have already contributed to help UCMP reach its goal. On behalf of the UCMP community, we thank you very much for your consideration and generosity.